A recent article in the Guardian pointed out the near-omission of Ann Radcliffe from recent celebrations of Gothic, occasioned by the 250th anniversary of The Castle of Otranto. As my students will tell you, I’m always banging on about how important Walpole’s novel is, not necessarily as a work of literature in its own right but for the genre it spawned; the major features of his short book recur persistently throughout the Gothic form right up to the present day. But perhaps it is time to point out how important Radcliffe is, too – and in my research I keep coming back to her. 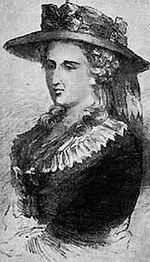 In fact, in terms of continuing and developing the genre, Radcliffe (1764-1823) is at least as important as Walpole; she developed her own style and approach to the genre in her novels (The Castles of Athlin and Dunbayne, A Sicilian Romance, The Romance of the Forest, The Mysteries of Udolpho, The Italian and Gaston de Blondeville). The best-selling author of her day, she wrote fantasy-fulfilment novels in which a heroine is threatened by a dastardly villain in a sublime mountain setting, often whilst she is searching for her long-lost mother. She’s easy to parody, as Jane Austen did in Northanger Abbey, but her success was huge, and they are still captivating (when I first read The Mysteries of Udolpho when I was 16, I couldn’t leave the house until I’d found out what was behind the mysterious black veil in the castle). Her heroines become increasingly independent throughout her work, though they always remain decorous and moral, but in the face of threats they are active, brave and show spirit – not something that could be said of all female characters at the time. She shaped our modern ideas about the heroine in Gothic, as Ellen Moers acknowledged when writing about ‘Female Gothic’ in the 1970s. Radcliffe uses the dramatic plight of her heroines to mirror the claustrophobia and sense of helplessness engendered by the social roles imposed onto women, and layers this metaphor with a suspenseful narrative which concludes with a happy ending. In an essay entitled ‘On the Supernatural in Poetry’ Radcliffe writes knowingly that ‘I am speaking of the only real witch – the witch of the poet; and all our notions and feelings connected with terror accord with his’. True, and she was just such a writer-witch, though it is interesting to note that the article is set up as a dialogue between two men, and the poet is referred to as male. 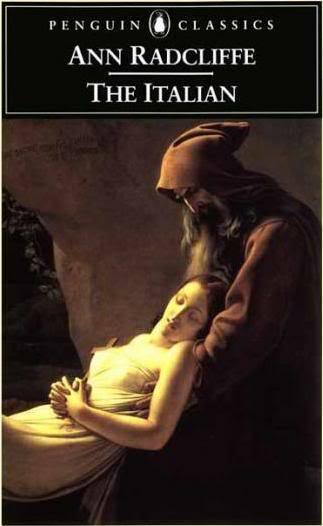 Yet in the essay she discusses Shakespeare as a Gothic antecedent, and structures the Gothic genre as divided between terror and horror, a division still present today. Referring to Burke’s work on the sublime, she writes: ‘Terror and horror are so far opposite, that the first expands the soul, and awakens the faculties to a high degree of life; the other contracts, freezes, and nearly annihilates them.’ Horror, as far as she was concerned. was beyond the pale and certainly inappropriate for young women (she was, I imagine, thinking particularly of Lewis’s The Monk, which she countered in a more respectable novel The Italian). Her Gothic was more decorous, then – on the surface, at least: reading between the lines and into the murky depths of Gothic, one can find traces of much less respectable notions. She was, despite her huge popularity, a truly literary writer, too. The epigraphs to each chapter testify to her own wide reading, and she was popular not just with the young woman reader of Northanger Abbey but also with literary heavyweights including Coleridge (and most of the Romantic poets), Walter Scott, Tennyson etc. As mistress of the sublime landscape and its effect on the human mind, she had much in common with many of these writers, and her settings, including remote castles which can be read psychologically as well as aesthetically, were clearly much of the appeal for her readers. 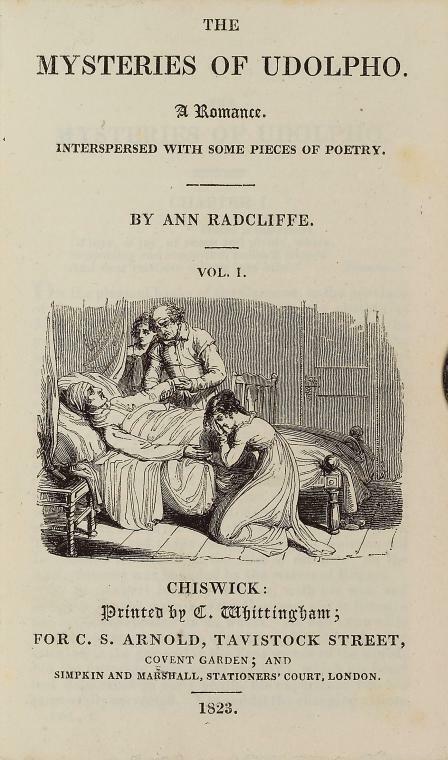 So Radcliffe transformed Gothic into a woman’s genre, both as writer and reader. She offered her heroines and her readers more autonomy and freedom than every before. Why is she now apparently insignificant? I think a lot of this is to do with her very respectability. Unlike the flamboyant and wealthy Walpole, or Lewis in high society, Radcliffe – always known to her contemporaries as Mrs Radcliffe – lived quietly at home. Her husband clearly didn’t object to her writing, though no one knows why she suddenly stopped at 32. But so little is known that when Christina Rossetti tried to write a biography of Radcliffe, she gave up for lack of material. Rumours abounded, of course, about this ‘mysterious’ woman: she ate raw pork before bed to give her dreams to fill her novels; she had been arrested as a spy in revolutionary Paris; her imagination had driven her mad and she was confined to an asylum. None of these – so far as we know – were true, but perhaps they in some way made up for her being a homely woman who didn’t ‘live the Gothic’ in the flamboyant style of her male near-contemporary writers of the genre. Previous Frankenstein: A monster of a different kind? Thank you – your paper is excellent and I agree that we need to find ways to read Radcliffe now without our perception becoming coloured by her reputation. It’s also a shame Scott is no longer read; I read both Scott and Radcliffe as a teenager and loved them!